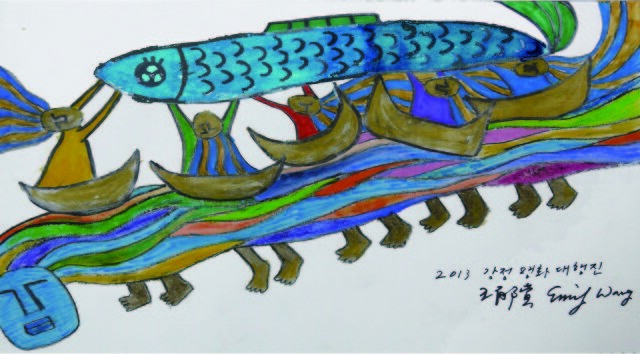 We so thank for all the international solidarity messages for 2013 Grand March for the Life and Peace of Gangjeong and Gureombi Human Chain. Though late, here are collected international solidarity messages. We especially express our gratitude to the international peace activists who have been unjustly denied entries to Korea for their support for our struggle opposing the building of the Jeju naval base but sent warm and strong messages of support. Some of them such as Nagaya Yukiko collected her friends’ messages as well with Korean translations. We also thank translators, Jo Yak Gol and Park Youn-Ae, Park Jin-Hwan for kindly helping or volunteering translations. 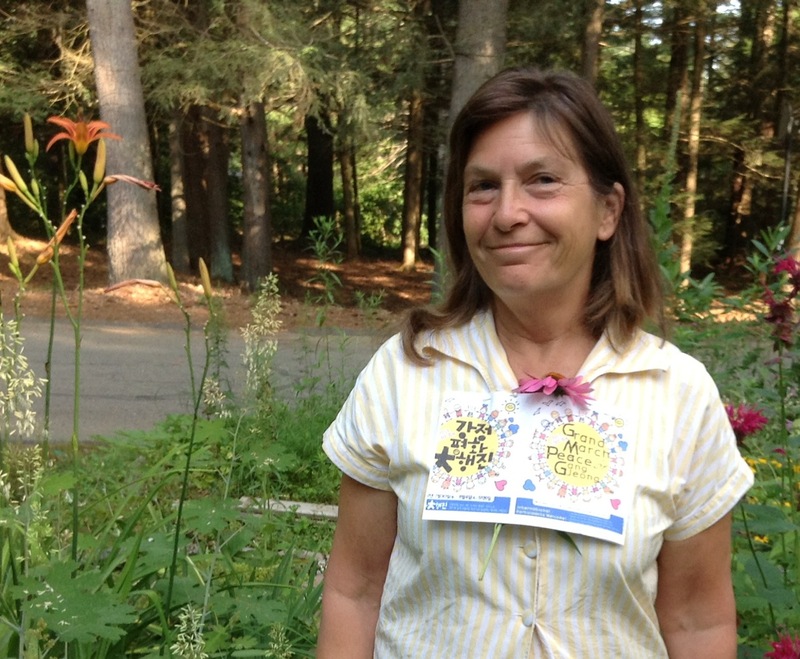 We also thank friends such as Amy Woolam Echevera who gathered signs for us from the friends all over the world. And friends in the UK and Australia for having solidarity actions for us. If there are any missed messages here though you have sent us, please let us know (gangjeongintl@gmail.com) . Thank again for all your warm friendship and support. Your sea is our sea, your soil is our soil, your protest is our protest, and may we always remember that and real-ize that. All of my best wishes for a world at peace, with the security that only peace can provide. 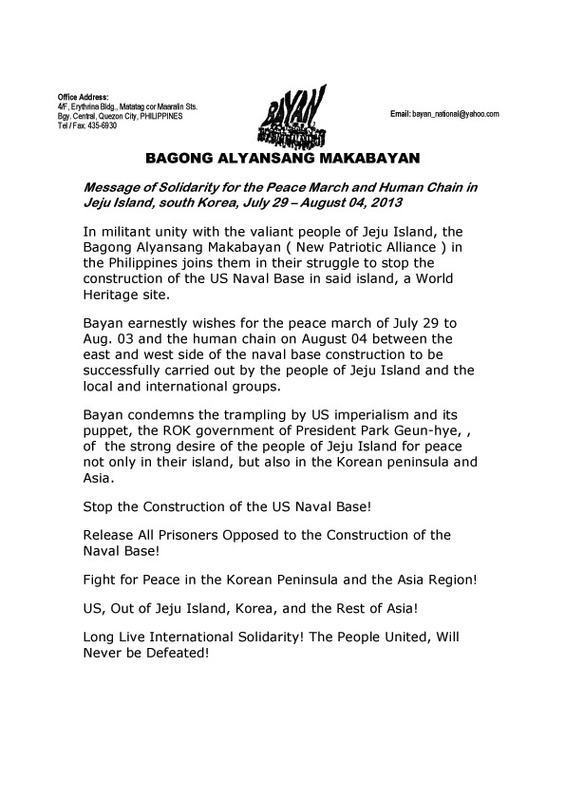 In militant unity with the valiant people of Jeju Island, the Bagong Alyansang Makabayan ( New Patriotic Alliance ) in the Philippines joins them in their struggle to stop the construction of the US Naval Base in said island, a World Heritage site. 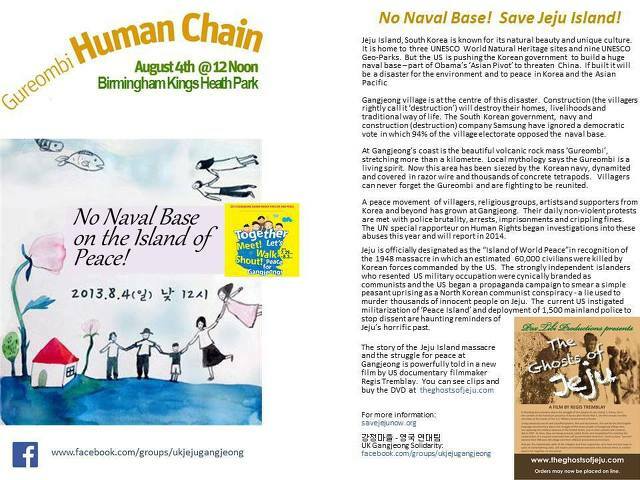 Bayan earnestly wishes for the peace march of July 29 to Aug. 03 and the human chain on August 04 between the east and west side of the naval base construction to be successfully carried out by the people of Jeju Island and the local and international groups. Bayan condemns the trampling by US imperialism and its puppet, the ROK government of President Park Geun-hye, of the strong desire of the people of Jeju Island for peace not only in their island, but also in the Korean peninsula and Asia. Stop the Construction of the US Naval Base! Release All Prisoners Opposed to the Construction of the Naval Base! Fight for Peace in the Korean Peninsula and the Asia Region! US Out of Jeju Island, Korea, and the Rest of Asia! Long Live International Solidarity! The People United, Will Never be Defeated! I am writing to you from the National Green Party’s Annual Gathering here in the US. Last night I showed the film The Ghosts of Jeju to some of the people and they were very moved. I know I speak for the Green Party members that I know all over the US and the Green Party Peace Network that I started with another Green, we are behind your struggle and are so saddened and angered by both what has and is now going on in Jeju. We send our thoughts, prayers, strength and love to you all in your continued struggle and will continue to show and pass on this wonderful film that Regis Trembly did from his visit in Jeju. You are in our hearts and souls. Stay strong and safe. Love, jacqui [Maine]. 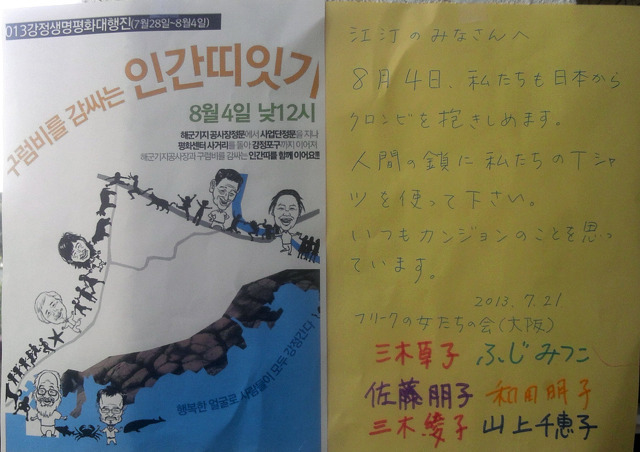 Hello friends of Jeju Island, we are having a march and rally on 4 August 2013 and will be speaking about the issues you ate facing in Jeju Island! 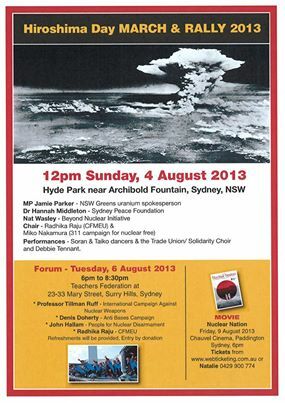 in solidarity – The Hiroshima Day Council Sydney. My name is Amy Woolam Echeverria and I am a colleague of Columban Fr. Pat Cunningham. 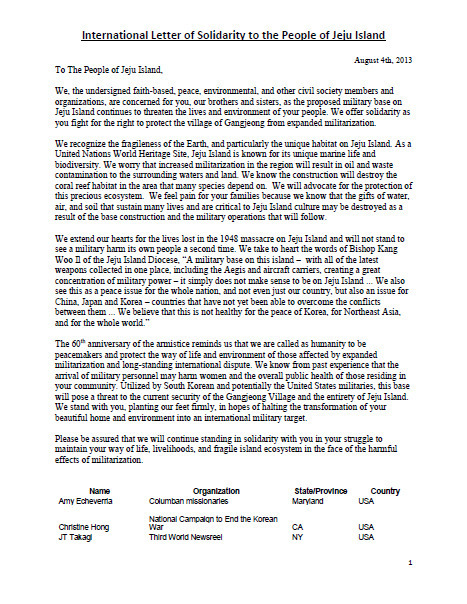 For quite some time we have been following the situation in Jeju through Pat’s updates which have informed our advocacy efforts for peace here in the U.S. We hope you receive the attached international letter of solidarity in time for your events on August 4. Please know of our ongoing concern and work to accompany you in your struggle for peace. If we can be of support in any way, please let us know. 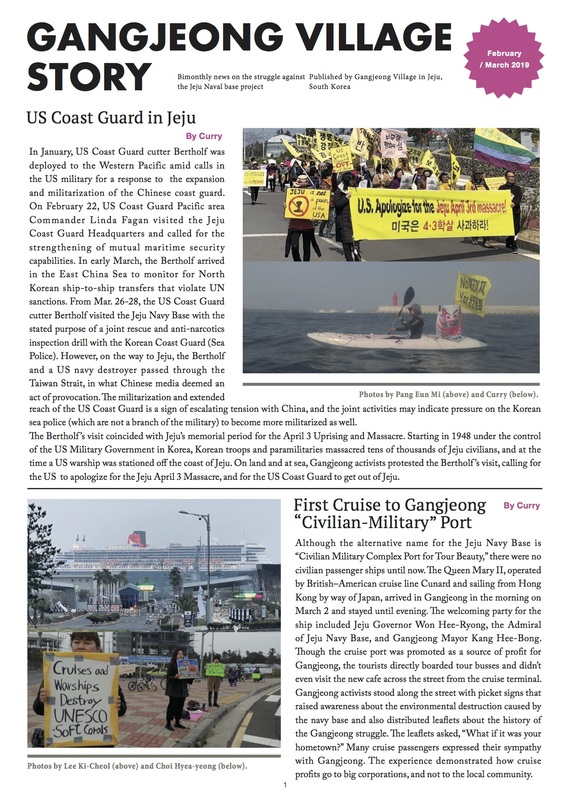 We, the undersigned faith-based, peace, environmental, and other civil society members and organizations, are concerned for you, our brothers and sisters, as the proposed military base on Jeju Island continues to threaten the lives and environment of your people. We offer solidarity as you fight for the right to protect the village of Gangjeong from expanded militarization. We recognize the fragileness of the Earth, and particularly the unique habitat on Jeju Island. As a United Nations World Heritage Site, Jeju Island is known for its unique marine life and biodiversity. We worry that increased militarization in the region will result in oil and waste contamination to the surrounding waters and land. We know the construction will destroy the coral reef habitat in the area that many species depend on. 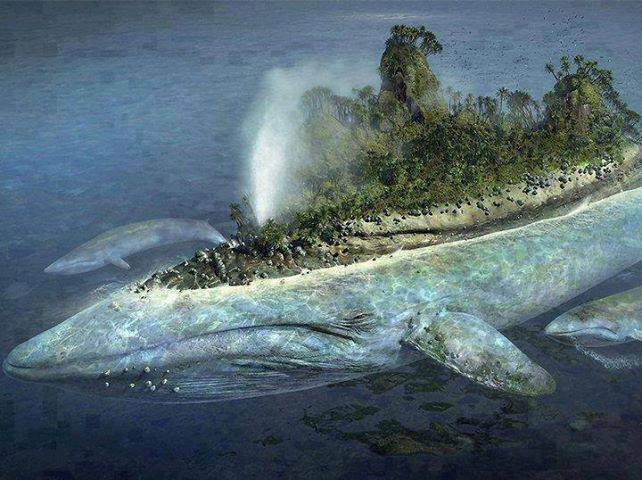 We will advocate for the protection of this precious ecosystem. We feel pain for your families because we know that the gifts of water, air, and soil that sustain many lives and are critical to Jeju Island culture may be destroyed as a result of the base construction and the military operations that will follow. We extend our hearts for the lives lost in the 1948 massacre on Jeju Island and will not stand to see a military harm its own people a second time. We take to heart the words of Bishop Kang Woo Il of the Jeju Island Diocese, “A military base on this island – with all of the latest weapons collected in one place, including the Aegis and aircraft carriers, creating a great concentration of military power – it simply does not make sense to be on Jeju Island … We also see this as a peace issue for the whole nation, and not even just our country, but also an issue for China, Japan and Korea – countries that have not yet been able to overcome the conflicts between them … We believe that this is not healthy for the peace of Korea, for Northeast Asia, and for the whole world.” The 60th anniversary of the armistice reminds us that we are called as humanity to be peacemakers and protect the way of life and environment of those affected by expanded militarization and long-standing international dispute. We know from past experience that the arrival of military personnel may harm women and the overall public health of those residing in your community. Utilized by South Korean and potentially the United States militaries, this base will pose a threat to the current security of the Gangjeong Village and the entirety of Jeju Island. We stand with you, planting our feet firmly, in hopes of halting the transformation of your beautiful home and environment into an international military target. Please be assured that we will continue standing in solidarity with you in your struggle to maintain your way of life, livelihoods, and fragile island ecosystem in the face of the harmful effects of militarization. I lived on Jeju-do for two years and fell in love with the island. To learn that the fight for the sanctity of Jeju-do is still ongoing is distressing. Here in Chicago, I am thousands of miles away from the picket lines I’d rather be standing on. In order to do my part, I’ve decided to rerelease the original performance of Build Your Base. This was performed in the Gangjeong Village Hall on June 26, 2010. I stand with in you in spirit. I am unable to be with you but my prayers are with you! I write this message of solidarity from Darwin, Australia where local activists are beginning to expand their efforts to protest the US deployment of 2,500 Marines as part of Obama’s “pivot” into the region. Before I came here I was in the Philippines and visited the former US Navy base at Subic Bay. I learned that about 5 US warships each week are coming back into that port. My thoughts are with Gangjeong village as you prepare to begin the peace march and human chain. I send you my heartfelt greetings and wish I could be there with you. Please know that your story of peace, love, and respect for nature is spreading around the world. You are not alone. Blessing to you all. We join hands with you. ‘In 2010 i swam around Jeju to raise environmental awareness. Seeing Jeju from the sea makes you realise how much habitat destruction and inappropriate deelopment has already occurred. Sadly, the only clean water i swam through in ALL OF JEJU was at Gangjeong. It breaks my heart to see this development continue. I wish i could be with you all on Jeju to join the walk and hold hands in solidarity and support. Thank you for not giving up. –> Check the Korean translation and photos here. A solidarity message from Sakota Hidefumi(46) who was denied entry to Korea on Aug 26, 2011, with his 6-year-old son and Yamaguchi Yukiko(56), a AWC organizer in Kansai region. Mr. Sakota Hidefumi is a peace activist and Korean language translator from Japan. 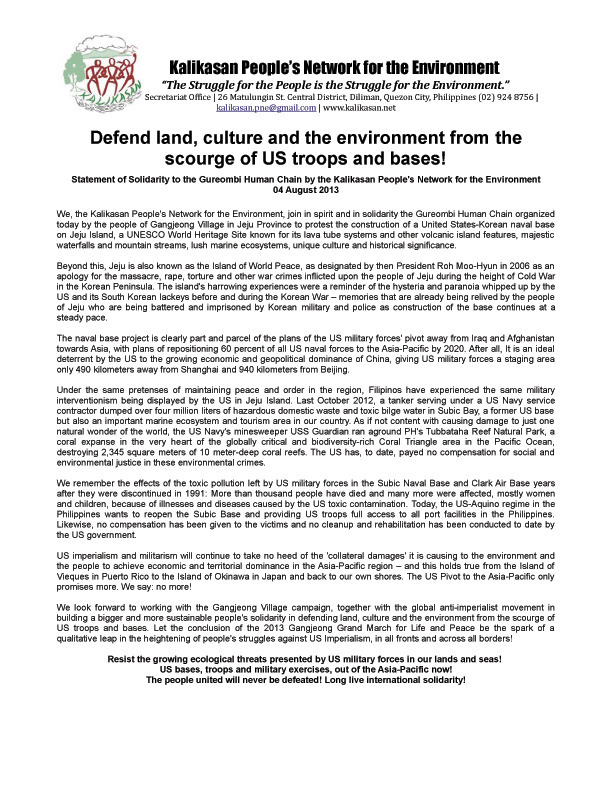 Dear, Gangjeong villagers and peace activists. I support your struggle. And I oppose the construction of the Jeju naval base by Korean government. Your struggle is justice. Samsung’s comstruction and Police crackdown is injustice. I demand immediate release of wrongfully imprisoned people, and Korean government must lift the entry ban on foreign activists. I am sending my solidarity message to you with Gangjeong struggle in my mind. I am so regretful that I cannot participate in your creative actions due to Korean government’s unjust entry ban. However, I believe that we can do a lot of things to spread Gangjeong voice against Jeju naval base into the world. Let’s continue to fight for our freedom and all people’s liberation from the oppression of military base. Your struggle is our struggle. Name: Ikeda Takane (AWC-Japan) Denied entry to Korea and sent back to Japan on Jan 26, 2012. This is Leon from the environmental network Kalikasan PNE in the Philippines. [I was at the] International Conference on US Strategic Pivot to Asia-Pacific Militarism, Intervention and War in Manila last July. Hope we’re not too late to send you our solidarity statement in time for the human chain. Wishing you a successful action and we’re looking forward to working with you on the bases campaign! Leon Dulce National Campaign Coordinator Kalikasan-People’s Network for the Environment http://www.kalikasan.org http://kathangkatotohanan.wordpress.com ………………………………………………………………. Defend land, culture and the environment from the scourge of US troops and bases! Tark Kauff was forcefully and violently denied entry along with Eliot Adams and Mike Hastie on March 14, 2012. For more info on it, click here. Despite such ordeal, here is his warm message. Solidarity for the Gangjeong Peach March from Veterans for Peace. Many of us here in the states have been incredibly inspired and moved by the intensity, courage and long unceasing commitment of your struggle to resist U.S. and South Korean militarism at the expense of your island and people. You set an example of sacrifice for many of us. I was turned away from Jeju Island once, if I can I will try again as soon as possible. I want to learn from you all and stand in real solidarity with you all. I feel like you are family that I need to see. All power to you in the struggle. In the meantime I am sending a t-shirt and a hat and maybe something else if I can get it together. The Korea Policy Institute sends our deepest gratitude for your incredibly courageous and persistent efforts to resist the further militarization of your village and Jeju Island. For years now, across the pacific ocean, we have been watching and learning about your struggle. Whether on Facebook or hearing directly from Gangjeong villagers such as Jeong Young-hee or Mayor Kang Dong-kyun, or traveling ourselves to Gangjeong, we have been moved and encouraged by what you have created and continue to build in your resistance. This year marks the 60th anniversary of the signing of the Armistice Agreement. We know that an unended Korean War due to the absence of a permanent peace treaty is what justifies the further militarization of the Korean peninsula, and as a consequence Jeju Island. Your struggle to halt this militarization, to protect your 400-year old village, Gureombi, and the natural beauty which makes Jeju Island paradise island, is truly valiant. We are inspired by your unwillingness to accept injustice, despite the daily brutal violence you endure, including imprisonment and heavy fines. Your fearlessness in the face of all of this is a true testament to the selfless human spirit that is willing to sacrifice for justice, to protect the environment, and preserve the precious resources we have today for future generations. Please know we are with you and will continue to write and spread the word about your struggle. You are not alone. We are with you every step of the way. I feel honored to have come to know you, peace activists of Gangjeong, because you have shown me so much–about the hope and dream for a peaceful world and about your unwavering courage and passion to keep working to make it happen. You are the ones whose words of peace have wings to fly all over the world! Your struggle is our struggle. We must stop the insanity of war! Keep Jeju the Island of Peace! Greetings to you brave people in your struggle to save Gangjeong. Thank you for your courage and tireless efforts to protect the environment and your traditions. You are an inspiration to the whole world. I would return to struggle with you, but know that I would not be allowed into your country again. I am attaching some images that I made that you might like to use. With you in spirit A picture of solidarity for the Peace March. A message of harmony between mineral, vegetal and animal, are humans catching it? Connection with Gureombi must remain alive. Until the advent of loving kindness. that our struggle is right and just. Often my tears flow in front of your devotion. Nagaya Yukiko (Yamaguchi Yukiko) from the Japan AWC was unlawfully denied entry to Korea on Aug 26, 2011 along with Sakota Hidefumi and Sakota’s son. They were translators and were stuck and illegally held at the airport for 3 days and deported back to Japan on Aug 28. They tried to use their rights to file a formal objection, but the Korean Immigration told lies, saying there is no such a process in Korea. You can read the full report of the case in here. Afterwards, Nagaya Yukiko started protest in front of the Korean embassy in Osaka and other places on every Wednesday. She has strongly protested Korean government’s unlawful denial of her entry and Jeju naval base construction. We thank Nagaya Yukiko for her continuous efforts to put solidarity messages together and translate them into Korean language. by the majority of citizens worldwide. not possessing the ability nor facilities for war. I thank you for your tenacious efforts in peace and for peace. To visit Gangjeong is to know and to love Gangjeong and her people. With each passing day, more people around the world stand in solidarity with you. Your spirit and energy is infectious in spite of seemingly insurmountable odds. Your struggle is our struggle as we rise up against the crimes against humanity and the natural world! War, capitalism, militarism, and imperialism must be replaced with peace and justice for all. Tomiyama Masahiro is the co-chairman of Okinawan-Korean People’s Solidarity against US military base. He was denied entry to Korea twice, Apr 6 of 2012 and Sep 5 of 2012, a day before the World Conservation Congress opening ceremony. 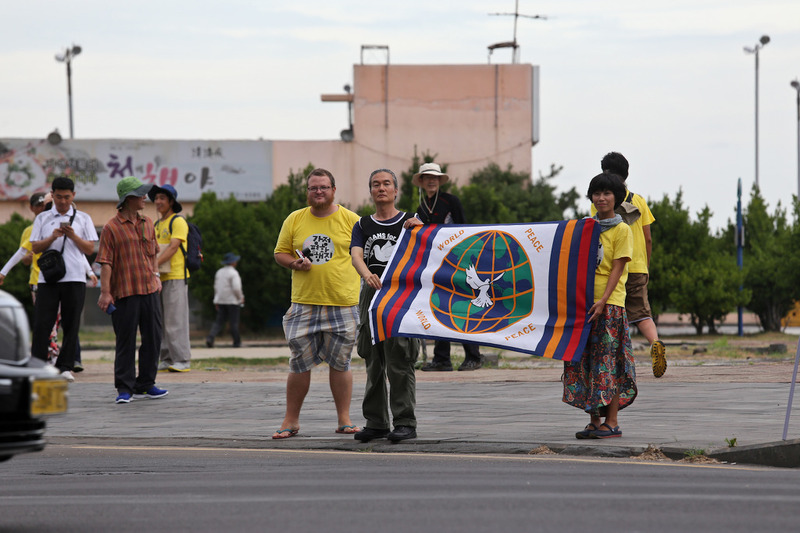 Several other Japanese peace activists such as Yagi Ryuji and Okinawan musician such as Wumisedo Yutaka were repeatedly not allowed to enter Korea, two times respectively. We also thank Park Jin-hwan for translating the messages into Korean. 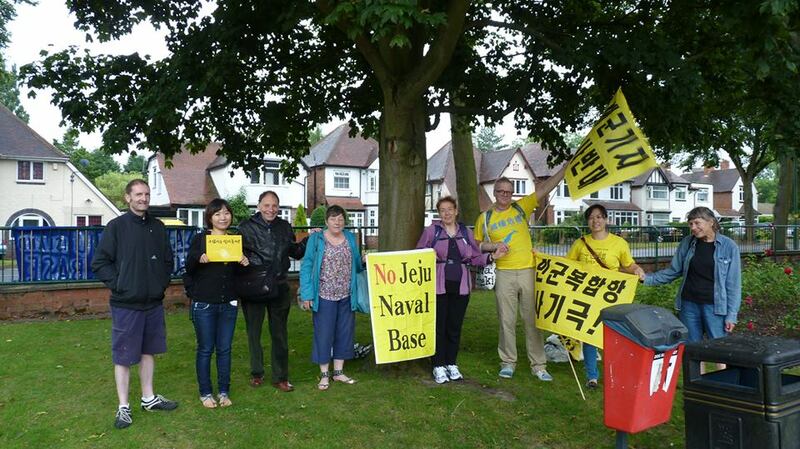 Dear comrades who gather in Gangjeong village to stop the construction of Jeju naval base. I send this solodarity message from Okinawa. In Okinawa, on Sep 10 last year, about 100,000 people attended the Okinawa general demonstration and began a pan-Okinawan action to fight for shutdown of the world’s most dangerous Futenma US base, to stop the Henoko new base construction and to withdraw the deployment of the flawed Osprey aircraft. As the whole Japanese society is leaning toward right-wing, an Okinawan progressive candidate won the Jul 21 Upper House election as Itokaz was elected as a member of Parliament by beating a conservative candidate. However, the far right-wing Abe’s Liberal Democratic Party won a huge nationwide victory in the election. And the government is getting ready to deploy 12 more Osprey aircraft that have caused continuous problems, such as crashing to land and killing people. The new administration is pushing pressure on Okinawa governor to get a permission to reclaim the Henoko sea area to build the military base on it. The construction of an Osprey takeoff and landing base in Takae is resumed and going on despite people’s protest. Abe administration ignores the will of people and makes Okinawa succumb to the central government. It incites nationalistic sentiment among general public by bringing territorial disputes, aiming to change the Constitution for the worse with a clear purpose to establish full-scale military forces. We must stop this Abe’s dangerous and violent moves. Beyond the border, all people in Asia and across the world, let’s come together with peaceful hands. Let’s bring our hearts together across the barrier. Let’s accomplish the big success of Gangjeong Grand March and human’s wall across the fences of Gureombi. Dear Gangjeong people, This is Emily. I send my congratulations and my big hugs to you for your success on the Peace March and Human Chain. 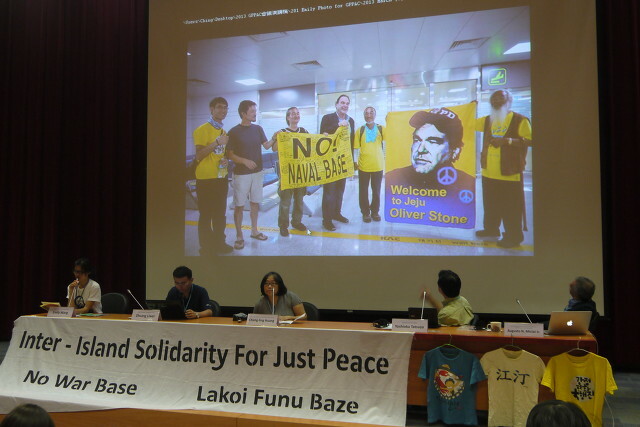 While you were in the march, I am also attending a oceanic peace forum to talk about Jeju base and working for the inter-island solidarity for just peace for our region. The awesome grand march photos were shown in my presentation as well. Peace is the way without boundary, so I believe we are walking together. You are not alone. This is a big solidarity from Taiwan. A solidarity t-shirt will arrive in Gangjeong soon. Good Job! 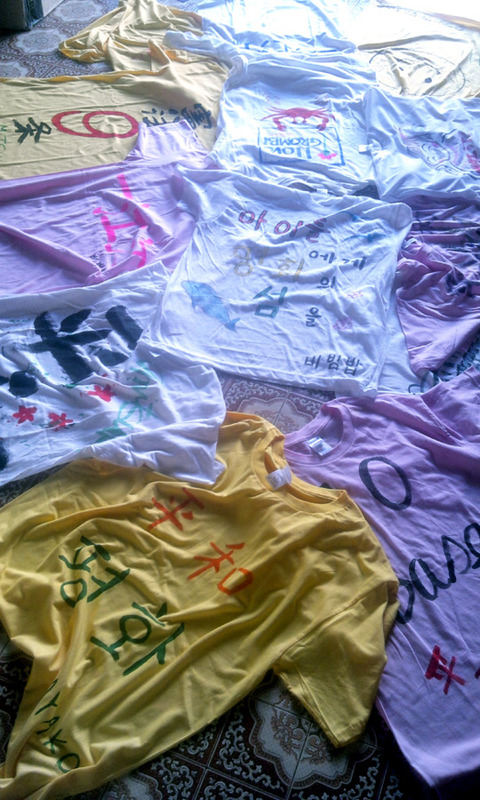 We are Japanese group called Women in Freak in Osaka. We are always thinking of you and we never forget you, your brave work, your joyful movement.